If you guide someone, it means that you show them where they need to go. She guided me to my seat. A guide is someone who takes tourists to interesting places. They usually give you information about the places too. Our guide told us the history of all the old buildings. 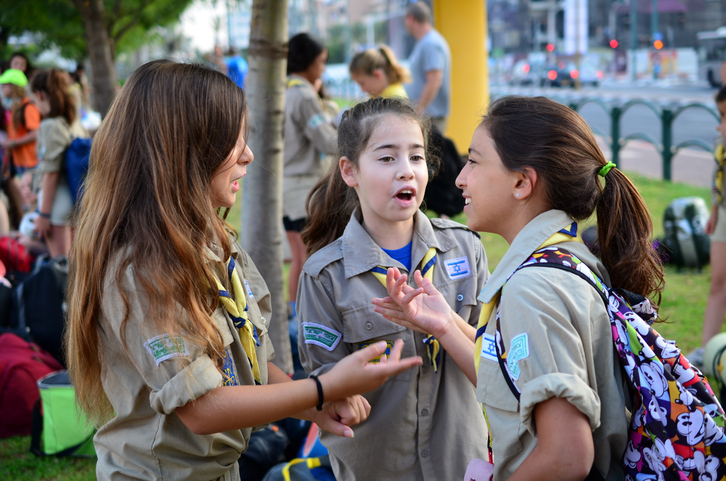 The Girl Guides is an organization for girls. They can learn new skills and they often do outdoor activities like camping. The girls are called girl guides and they wear a uniform. You can see a picture of some girl guides at the top of this page. A guidebook is a book for tourists about a city or country. It tells you about all the best places you can visit. The Hitchhiker’s Guide to the Galaxy is a movie about a man who travels across the universe. He uses an electronic guidebook to help him understand everything. It has lots of information in it about the different aliens and planets. Watch this video about the movie. What kind of movie do you think it is: a sci-fi, a comedy or a horror? There are other meanings of guide.